Had a real struggle rigging these, so I hope they work OK. 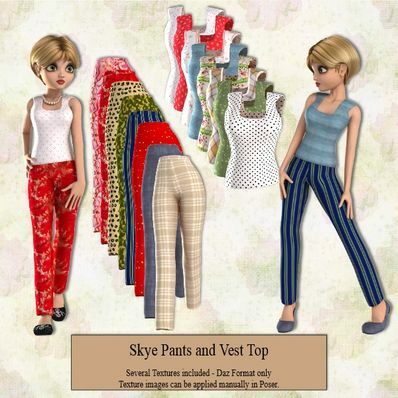 Pants and Vest Top for Skye with textures in Daz format. Several textures for the included. Unable to make Poser texture MATs but the texture images can be applied in Poser. Daz formats found in People/Genesis/Clothing/Pusey Designs/Skye/Clothing as I wasn't sure where to place them. Unzip and copy the files to your Runtime folder.